So, the last entry on my site is from 2014. Oh what changes we've seen! 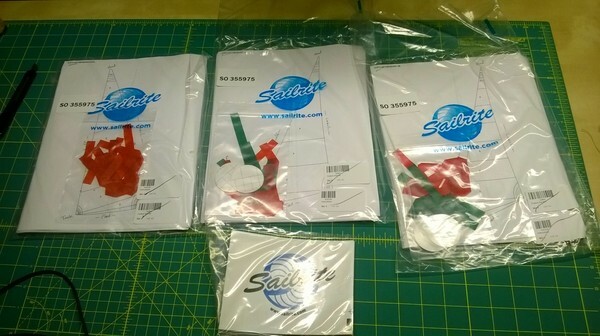 Finished my sails for me and they are beautiful! 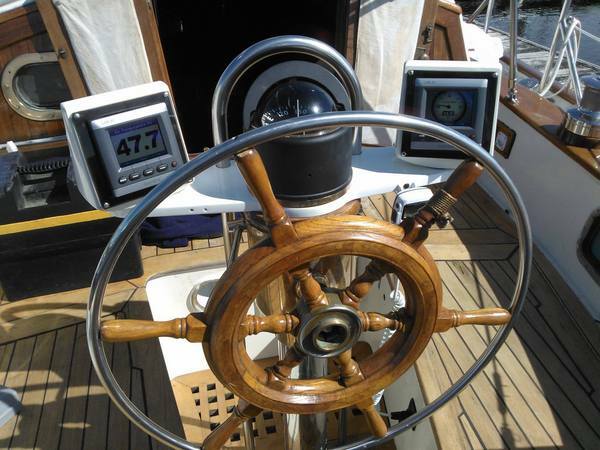 At the absolute end of the season, we managed to get one of the ProFurl Roller Furlers on for the Yankee. 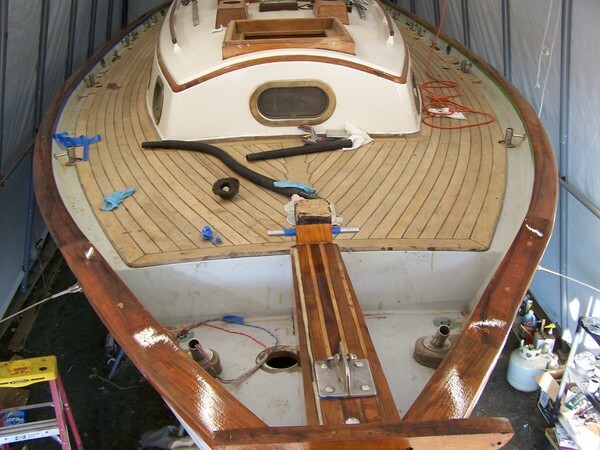 This year I hope to get the Stays'l furling in place. It is such a major convenience! 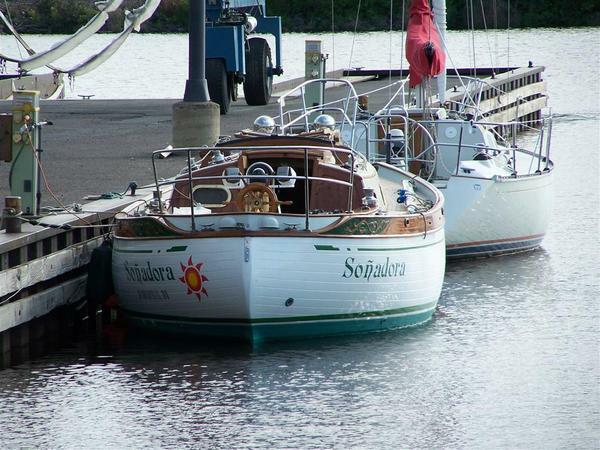 Soñadora's sails are old and worn. They may even be the original sails from 1978. They are soft and cuddly. Like bedsheets. Which is not the way sails should be. I've been pondering this for years. A new suit of sails from a reputable loft like Hood or North would cost around $5k. It's a pretty major investment. 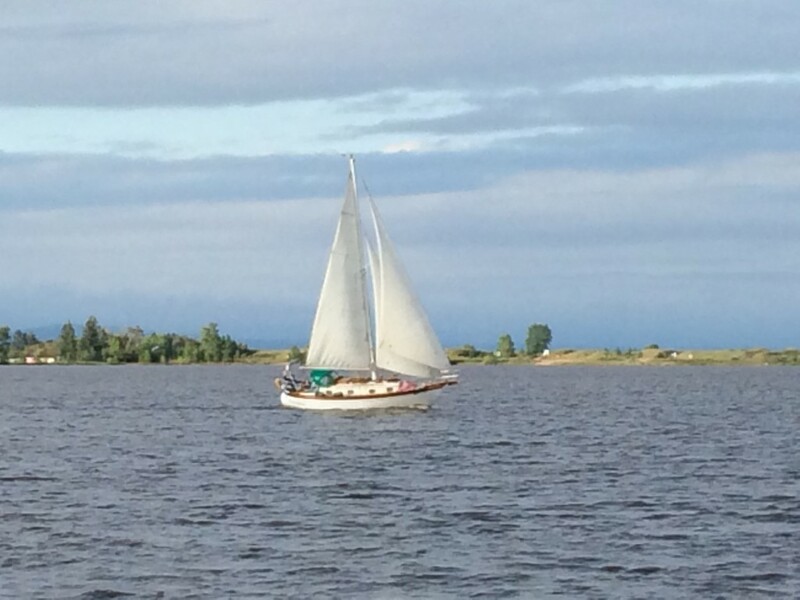 And a necessary one if you like sailing. The kits come with EVERYTHING. All the panels are pre-cut. All thread, glue, tape, etc comes in the package. One of the interesting items is the battens. They are shipped in one piece that will need to be cut down. 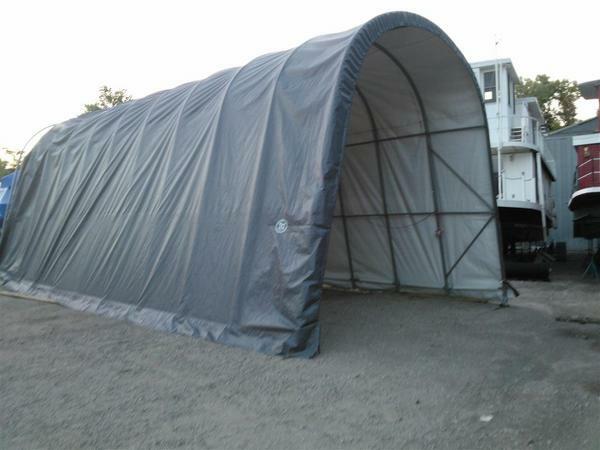 Since this thing is 9' long, it's difficult to ship. 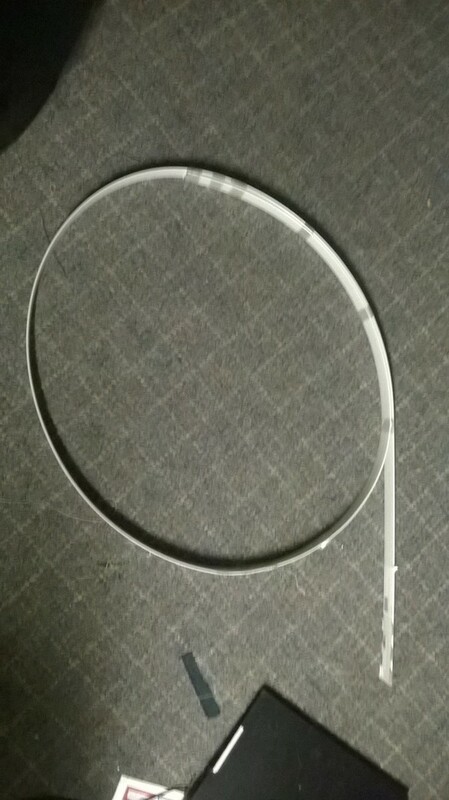 The piece is fashioned into a hoop and taped that way for shipping. These have to be un-hooped right away. There are warnings all over the box stating that this needs to be opened outdoors and held away from your body. It's basically a spring. As I slowly cut away the tape holding it into a loop, I decided it would be easiest to hold it between my knees while I cut away the tape. Just before getting whacked in the nuts, I realized this might be a bad idea. Thank you all who helped fund Mining Blue Sky! CONTRIBUTIONS NEEDED...DEADLINE IS QUICKLY APPROACHING! Looks like I've gotten myself into uncharted waters. 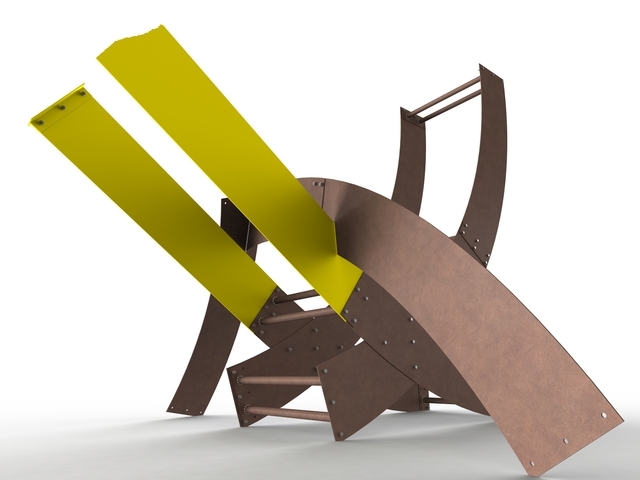 Many months ago, I submitted a design for a sculpture to be part of the Bemidji Sculpture Walk. I had submitted work for this in the past as well as other calls for entry. This time, my entry was accepted! What to do? I could have simply ignored it. After all, I'm no sculptor, right? I have a normal life (some would argue the contrary :) ) with a lovely family and job and all the stuff that keeps life humming along. But I've always had this desire jabbing me in the back. Constantly telling me that time is ticking away and maybe someday the opportunity for something like this will be gone. Why not now while I have the constitution to do it? Well, there are a LOT of reasons why not. And there were no shortage of people giving me those reasons. But, somehow I still felt compelled. And in the face of resistance, I pursued it anyway. I don't know any other way to explain this pursuit. It's deeper than just doing it for the hell of it. In some ways, I almost feel as though it's swept me up rather than me pushing to achieve it. In any case, it is done. I will be taking it up to Bemidji tomorrow and spending the day erecting it. Still much to do in the short time before I leave today. None of this is free, of course. And perhaps it is the way of the artist to carry such a burden. However, in this day and age, that doesn't have to be. Kickstarter is a crowd funding site that acts as a portal for projects they promote. This exposure provides a vehicle for creative people to pursue their ideas while helping to reduce the burden of costs. They have dome some amazing things with creative ideas. My project is currently accepted and we are taking any and all contributions. However, there's a catch. The ENTIRE project needs to be funded before funds are released. It is all-or-nothing. So, please visit my Kickstarter page and contribute as much as you can. The winter in MN has been BRUTAL. I think this has to be the worst winter I've experienced in my nearly 30 years here. It's enough to make me wonder why I moved here from Florida. There's still ice on Lake Superior. The marina still has ice. What to do? Looks like the only thing to do is pick up our little Capri and bring it up to the buoy on Lake Harriet. It's the first week in June and I don't think we've had temperatures above 70f. 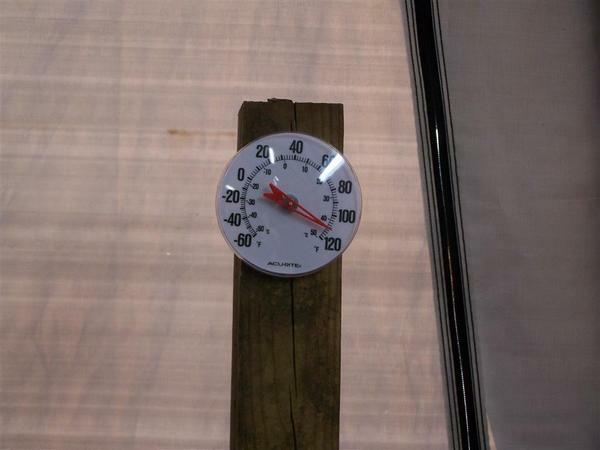 In fact, last weekend there was a frost warning in Duluth. I guess we've been fortunate to not have time to go sailing. I have had time, however, to get a lot of work done wrapping up all the wiring I still needed to do. 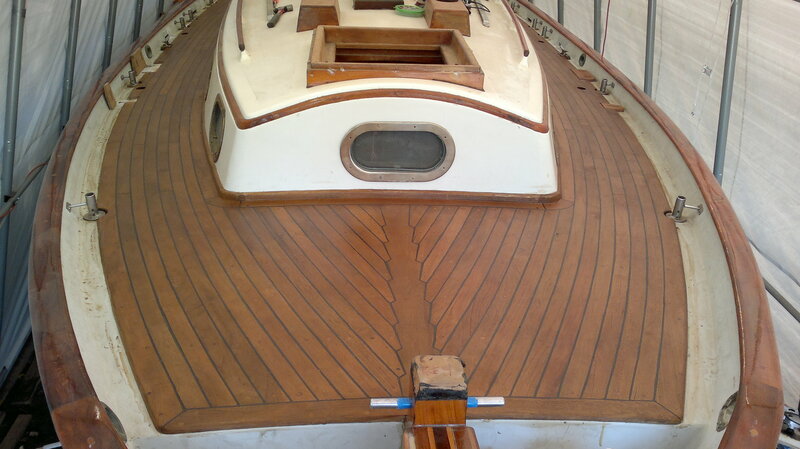 Finish varnishing and install cockpit table. Always stuff to do on a boat! I spent pretty much 2 days solid getting my electrical and electronics installed. The previous owner(s) took very creative license with the way things were wired. 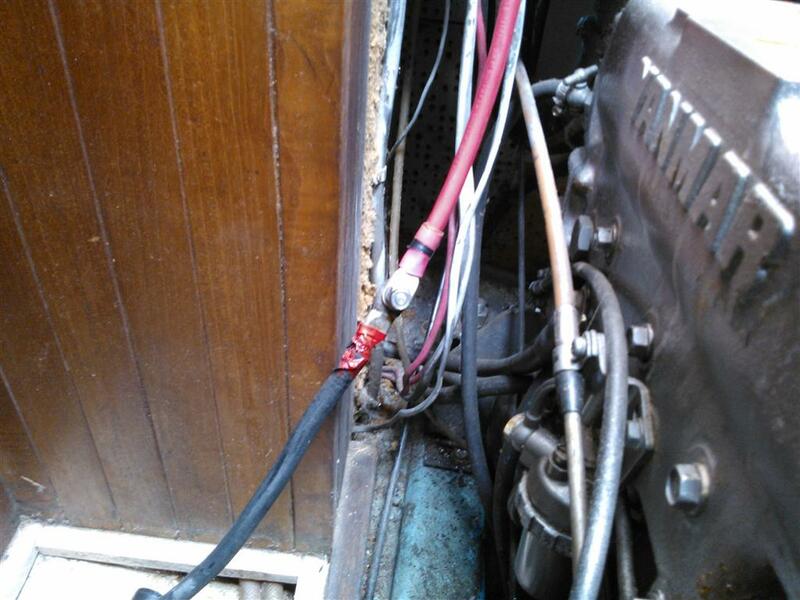 In the 12 years we've owned Soñadora, I hadn't really looked that much at the electrical systems. Each time I considered it and looked, I was afraid it would have made me insane. It was the epitomy of a rats nest. This image is the 'stock' panel from the yard. The original wiring is shown in the lower right of the image. 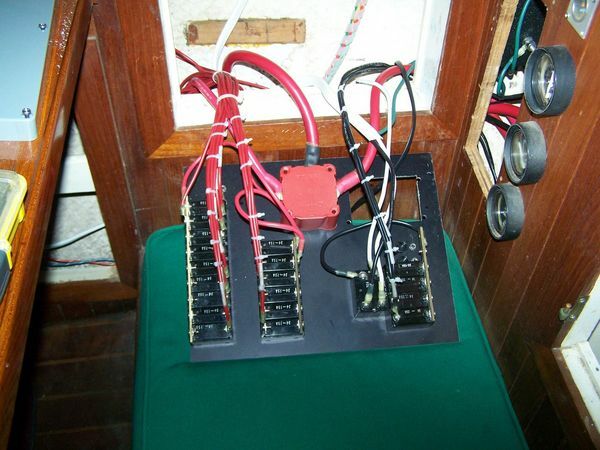 This was very simple wiring at first, consisting of about 10 breakers and mostly operated lights including nav lights as well as the bilge pump. It was a funky way to install with a teak retainer of some kind. All the common hot sides were soldered. Not a terrible way of doing it, but a real hassle if you ever wanted to change. Which is why I guess the P.O. decided to install several distribution blocks and busbars in random locations throughout. Granted, there are much, much worse examples out there, but this was bad enough, thanks. When I first considered tackling this job, I just assumed I was going to add a few breakers, but when I pulled the panels off and tried to figure out where in the world to tap into, I gave up. The only real conclusion was that I would need to take out all the wiring and start from scratch. 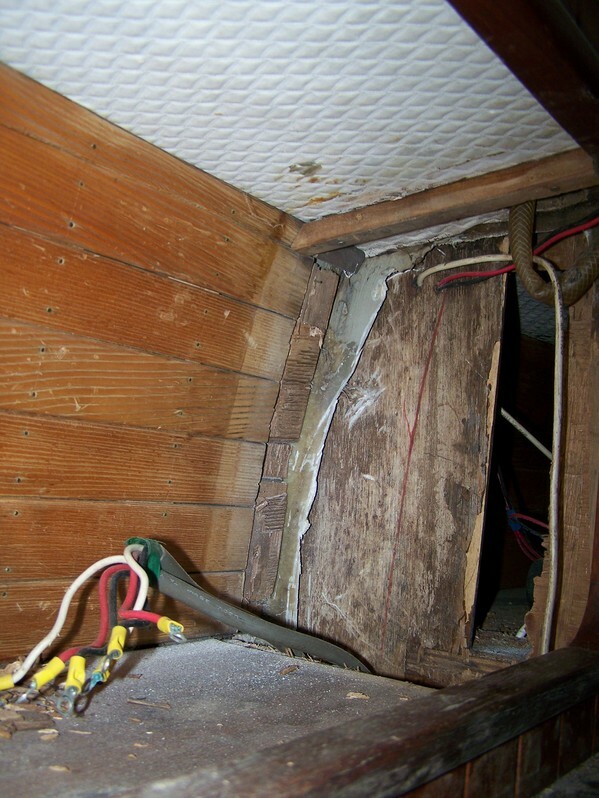 While the previous wiring you see here was 'functional', there were all sorts of things that were done without much regard to best practices or even common sense. 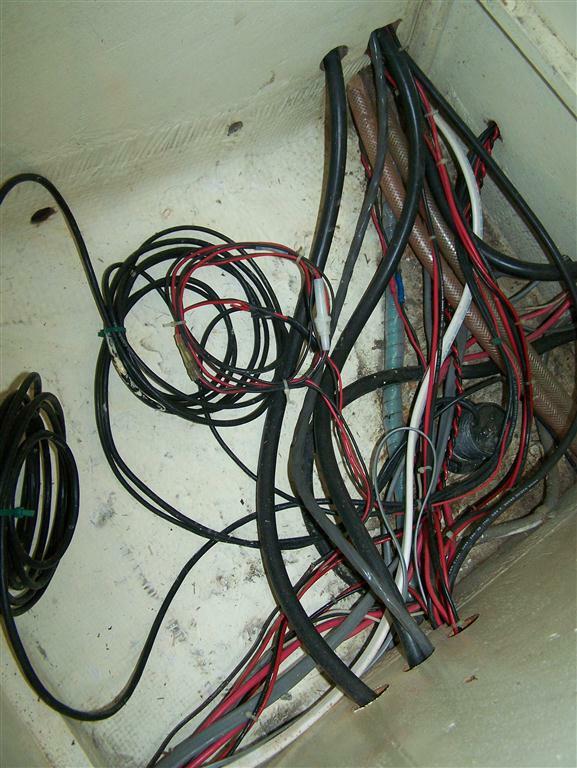 I did not like the fact that much of the wire was just tossed into a tangled mess at the bottom a locker where dirt and water could collect (especially under the wet locker). 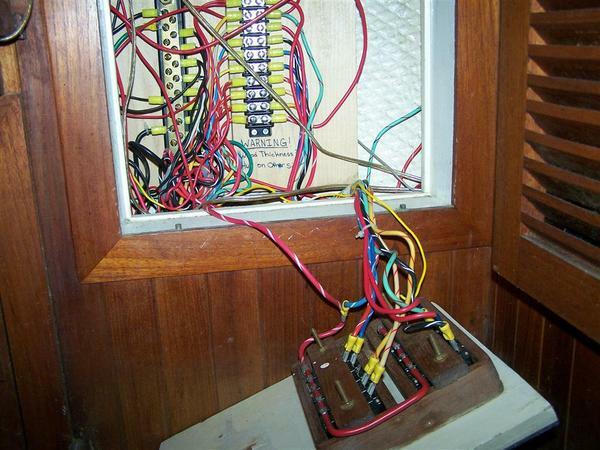 Nothing was labeled and many wires were spliced together in different colors, sometimes even red to black! There was also a lot of wiring needlessly running through the engine compartment. But I have to say one of the most concerning items I uncovered was a 'splice' which consisted of two 2 AWG cables connected with a bolt/nut. These were then wrapped with a great deal of electrical tape. That in turn had been covered at some point with a piece of hose and wire ties. This cable was the main hot cable going to the starter. The icing on the cake was that while the cable coming from the starter is red, the cable it had been 'spliced' to was black! Nevermind the red shrink tube attached to the lug in an attempt to specify this as hot. The shrink tube had been covered up with black electrical tape. The black cable was some sort of welding cable. It was not tinned and the sheathe on the outside was crumbling. When I bent the cable slightly, it cracked revealing the copper wire inside. I replaced all battery cables with proper, CONTINUOUS battery cables and where necessary terminated them on proper posts with covers. The previous wiring had several disparate areas of wiring. There was the main panel that had been put in at the TaShing yard in Taiwan. It consisted of 6 or 8 breakers to control lights and pressure pump. Then there was an added panel for additional lights and other items. This was mounted to a thin piece of plywood that blocked out the entire shelf next to the nav station. 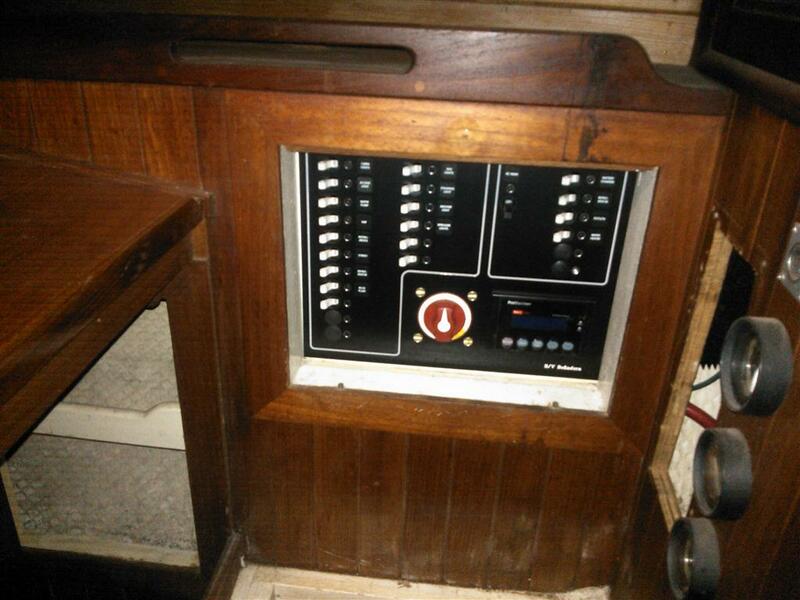 Then there was the 120V panel with 4 breakers. I designed a single panel that consolidated all these items plus added many more. 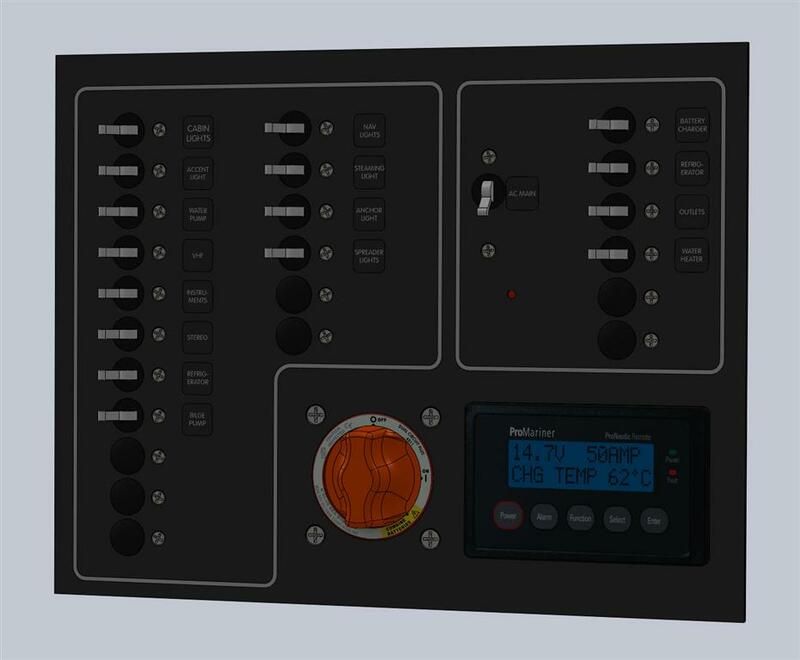 I designed this panel using SolidWorks. I sent the design to FrontPanelExpress.com (a fantastic tip I learned about from Sailing Anarchy). This was after a very lame attempt to manufacture the panel myself out of a sheet of aluminum. The panel turned out GREAT! My strategy was to use the panel to distribute the hot side of my electrical needs down to a locker where I would wire everything up in two NEMA cases. One case for 12V and one for 120V. It was a bit of a challenge getting all the wiring to behave nicely in those cases, but I managed to do it and it wasn't quote as chaotic as the previous wiring scheme. Wiring was straightforward and after a while I had the sequence pretty well figured out. The majority of the panel is wired with 14ga tinned wire or 2-14ga duplex wire. The duplex wire is great for running the wires where you need them, but I have to say in hind sight I think individiual wires are a better way to go. The ease of runs for duplex wire is offset by the hassle of stripping off the sheathe and making sure your leads are long enough. 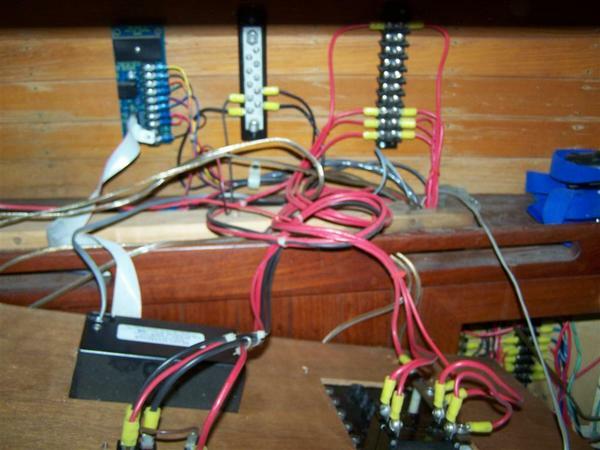 Then, when wiring up the terminal strips and buss bars, the beefy sheathe on the duplex wire started getting in the way. I terminated most of my wires with heat shrink connectors. I purchased two of West Marine's heat shrink connector 'kits'. In hindsight, I would do better to have just ordered 100 of the yellow (12-10 ga) and 100 of the blue (16-14 ga) terminals. I ran out of shrink terminals and luckily had some non-shrink terminals available. Still, I'm pretty happy how it all turned out. This whole adventure may have been a bit premature. I still had (have) a lot of work to do. But, I had to put a stake in the ground. This was getting to be a real mental challenge not to mention spending every night at the boat was making me feel like a foreigner at home. 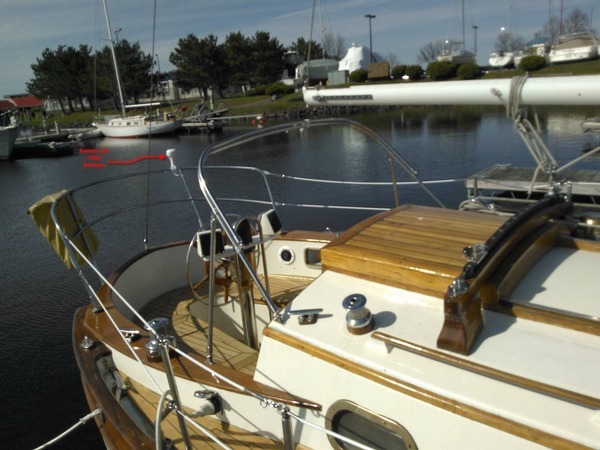 I was aching to get the boat in the water and get some sailing time in before the season ended. 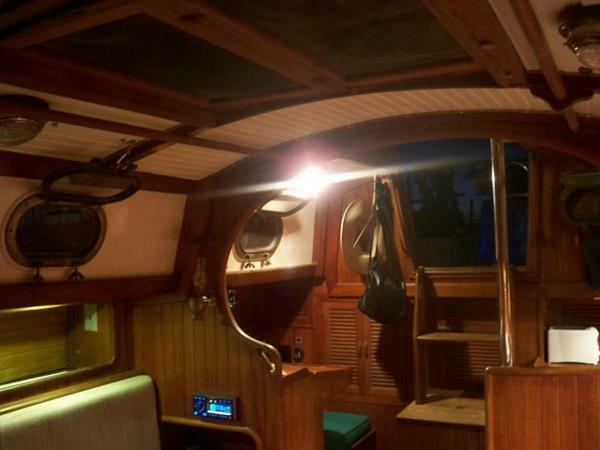 So I committed to having the boat picked up on August 2. That forced my hand and over the weeks leading up to the 2nd, I had to scrape up every ounce of time I could to get things done. No weekend family activities. No dinner at home. And stealing away from work as discreetly as possible. The guys at Watergate wanted me to have everything out of the shelter by the 31st. Up to that point, I worked frantically to check things off the list. I installed all the deck hardware. Finished rebuilding the forward hatch. Installed all the helm components. Painted the bottom. 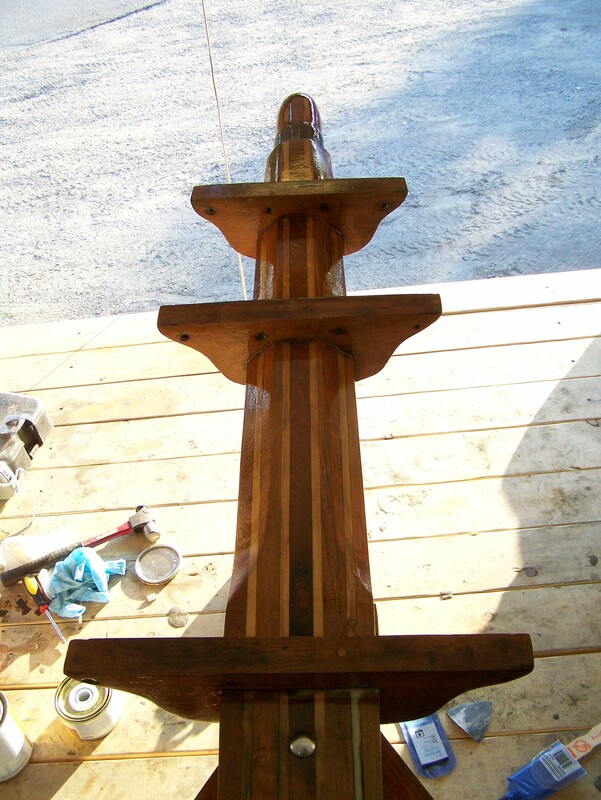 Attached the whisker stays to the bowsprit (should have done the bobstay too, but that's another story). Installed cockpit drain hoses. And probably a bunch of other stuff. On top of that, I had to cart everything out of the enclosure: anchors, chain and rode, tools, life jackets, trash, etc. I was up until 4 a.m. on the 31st. 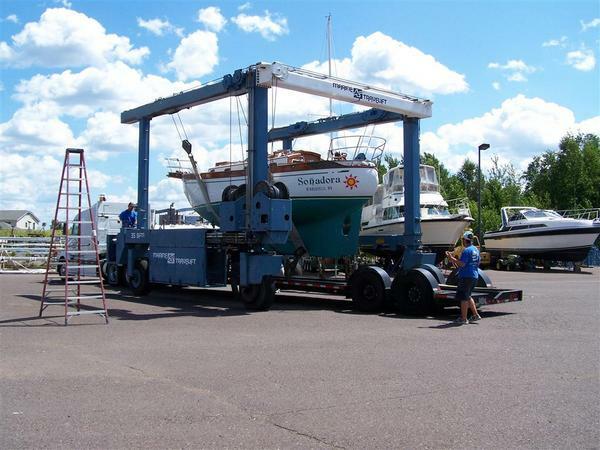 The next day, the guys at Watergate Marina moved the shelter away from the boat. And I still have a lot to do. Mostly electrical. I kept trying to get the electrical stuff done, but these other must-do things kept getting in the way. So when we got to Barker's, we had no electricity. Not even juice to start the engine. I went to Watergate around 7:30 a.m. just before the guy from Cross Country showed up. I was pretty impressed with his attention to detail. For instance, when he secured the mast he first wraped a small piece of plastic around it then used duct tape on top of the plastic. That way the glue from the tape didn't get stuck all over the mast. I had planned to follow the truck up to Superior, but I had agreed to let Emma have a sleep over with friends the night before and I had to pick her up. Also had to get her two friends Emma (braces) and Olivia. On top of that, while I was at Watergate watching the boat get loaded, this old dude (Bob) struck up a conversation with me and convinced me to come down and have a look at his boat. He was a real charmer, so I couldn't say no. The truck left as I was hanging out with Bob. Emma was actually really excited about going and was ready to leave right away. We picked up her friends and took off. It was really great having them along. What a fun bunch of girls. They had a great attitude. The first night we were in Barker's, they slept in the cockpit. It rained the next night, so they slept in the van. On Friday, I drove them in to Duluth and let them hang out there for as long as they wanted. They loved it. They spent most of their time in Canal Park and actually went swimming at the 'beach' there. Freakin' northern girls. Thick blooded. Minna, Celia and Sonja showed up on Saturday. After a late breakfast, Minna took everyone up to Gooseberry Falls for the day. On Sunday she took them to Splitrock Lighthouse. I need to say something about the guys at Barker's Island. I was blown away at how friendly they were. Coming from a marina where they put the 'cuss' in 'customer service' at Hansen's Harbor, to this place was like heaven. At every turn they were asking if we needed anything. Barker's is the biggest marina on the Great Lakes. And their reputation is fantastic. I can see why. It's been sweltering hot here in Minnesota. We're breaking records all across the board. Inside the boat shelter, temps are approaching 120 degrees. I am not paid enough to work in those conditions. So I have to open up the shelter and let the cool, outside 96 degree air into the shelter. Maybe the upside is that all that varnish and paint I'm applying is getting 'baked in'. I need to be as close to 100% done by the end of the month. On August 2, we will be shipping Soñadora up to Superior, WI to Barker's Island Marina. We will still have some loose ends to tie up, but hopefully nothing major. 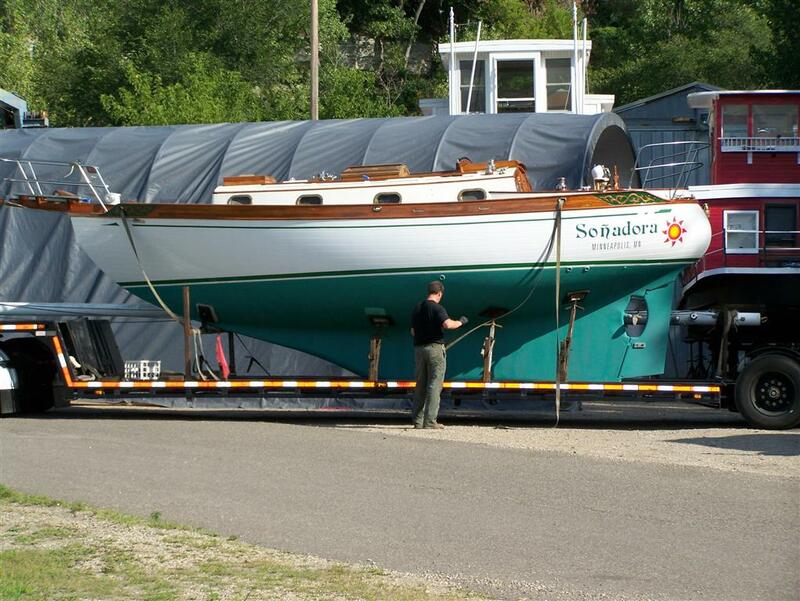 If we're lucky, we'll be in the water in August and will be able to take the boat out a few times before winter. But who knows, maybe with all this warm weather, we'll have 70 degree winter in Duluth. Whether I can finish or not, is moot. I need the psychological break to get the boat to Superior. Varnishing is all done now. I applied 6 coats of Interlux Perfection Gloss. Recommendation is for 4 coats. Hopefully this stuff will be as durable as advertised.